Docking Hardware, Antenna Relocation & Misc. SG-DH: This complete kit contains the docking hardware necessary to install the SG-1 and well as other accessories. Allows addition of accessories as your touring demands change. Includes docking points to allow installation of H-D® DetachablesTM Sissy Bar, Solo Luggage Rack, Two-Up Luggage Rack, Solo Tour-Pak® Rack or Two-Up Tour-Pak® Rack. Fits:Fits '18-later FLDE, FLHC, FLHCS, FLSL, FXBB, FXFB, FXFBS, FLSB and FXLR models. Chrome or gloss black. 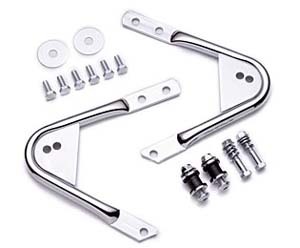 HD-803: Detachable hardware kit for Sissy Bar Upright or Solo Tour-Pak® Rack. Fits '97-'08 Touring models (except FLHTCUI and '07-'08 FLHRSE3/4). 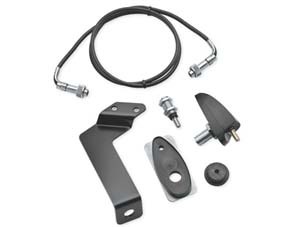 HD-804: Kit contains the docking hardware necessary to install HD-276-4 Two Up Detachable Rack on your Road King®, Road Glide®, Street Glide® or Electra Glide® Standard model. Fits '97-'08 Touring models (except FLHTCUI, and '07-'08 FLHRS). 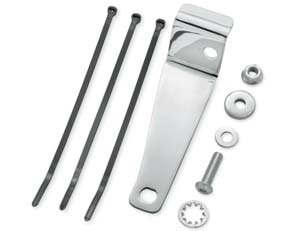 HD-205: 4-Point Docking Hardware Kit - For Sissy Bar Upright, Two-Up Luggage Rack, or Two-Up Tour-Pak. The ideal choice for maximum versatility, this complete kit contains the docking hardware necessary to install all detachable accessory options. Even if you only install a passenger backrest today, this kit allows you to add additional accessories as your touring demands change. Provides docking points to allow installation of Detachable Sissy Bar, Solo Luggage Rack, 2-Up Luggage Rack, Solo Tour-Pak Rack or 2-Up Tour-Pak Rack. 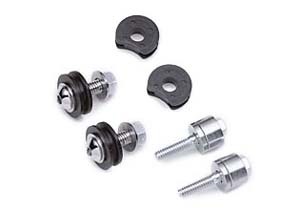 Easy to install, this Docking Kits bolts directly to the factory drilled and threaded fender struts for perfect alignment. Fits '09-later FLHR, FLHRC, FLHT, FLHX, FLTR, FLTRX, FLHXSE/2 and FLTRSE3 models. For use with Detachable Sissy Bars, Solo Luggage Racks, 2-Up Luggage Racks, Solo Tour-Pak® Rack and 2-Up Tour-Pak® Rack. 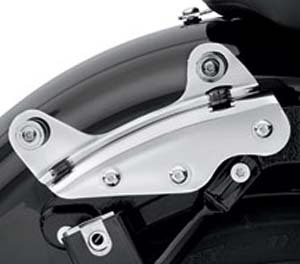 FLHRC models require separate purchase of Saddlebag Hinge Stop P/N 90580-09.els require separate purchase of Saddlebag Hinge Stop P/N 90580-09. HD-131: The ideal choice for maximum versatility, this complete kit contains the docking hardware necessary to install all Detachable accessory options. Even if you only install a passenger backrest today, this kit allows you to add additional accessories as your touring demands change. Provides docking points to allow installation of Detachable Sissy Bar, Solo Luggage Rack, 2-Up Luggage Rack, Solo Tour-Pak® or 2-Up Tour-Pak® Rack. Provides docking points to allow installation of Detachable Sissy Bar, Solo Luggage Rack, 2-Up Luggage Rack, Solo Tour-Pak® or 2-Up Tour-Pak® Rack. Kit allows you to add additional accessories as your touring demands change. Chrome finish. Fits MY 2014 to current touring models. 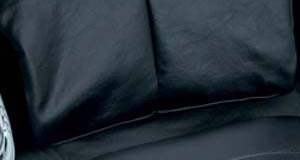 HD-131B: Similar to above but in black. 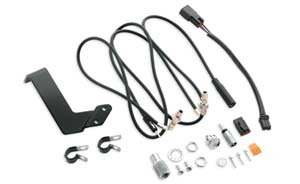 HD-032: Wiring Harness Kit allows the installation of Detachable Tour-Pak® Rack Kit HD-246 on Ultra Classic® Electra Glide® and Limited models. 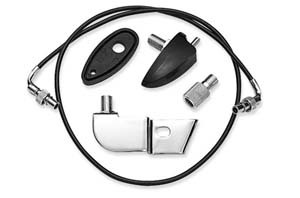 Kit includes rear lighting wiring harness, CB antenna relocation kit and passenger communication port mounting clip. Fits '09-'13 FLHTCU and FLHTK models equipped with Detachable Tour-Pak® Rack Kit Kit HD-246. HD-692: Wiring Harness for FLTRU model, for HD-246 kit. Fits '11-'13 FLTRU models equipped with Detachable Tour-Pak® Rack. HD-13: Detachable tour-pak light harness kit. 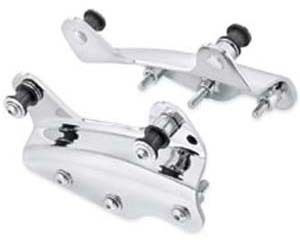 Fits '97-'05 FLHTC models equipped with Detachable Tour-Pak HD-303. 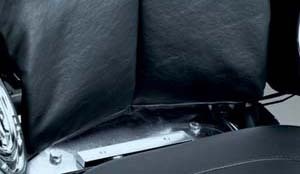 Antenna Relocation Kits: This innovative Antenna Relocation Kit allows you to easily switch between your detachable Tour-Pak® luggage, a detachable passenger backrest, or the clean look of a stock FLHT or FLTR. This product is available in multiple variations. 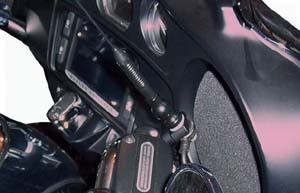 Be sure to look for the one that fits the specific model and year of your motorcycle. See below. HD-556: AM/FM. Fits '09-'13 FLHT, FLHTC, FLHX, FLTR and FLTRX models. Does not fit FLTRSE or FLHXSE models. HD-561: AM/FM. Fits '09-'13 FLHX, FLTR and FLTRX models (except FLTRSE3 and FLHXSE) equipped with Detachable Two-Up Luggage Rack. 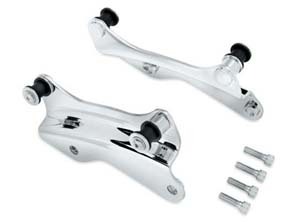 Does not fit with Nostalgic Saddlebag Guard Rail Kit. HD-326: AM/FM. Fits '98-'08 FLHT, FLHX and FLTR models. HD-208: AM/FM. Fits '97-'08 FLTR and FLHX equipped with Detachable Two-Up Luggage Rack and Two-Up Detachable Docking Hardware Kit P/N HD-804. HD-326: Antenna relocation kit, AM/FM. Fits '98-'08 FLHT, FLHX and FLTR models. 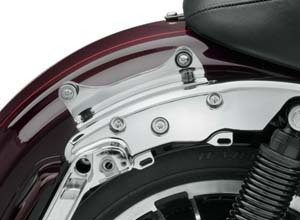 HD-308: Relocates your CB antenna to the rear fender to accommodate use with a Detachable Two-Up Tour-Pak® Mounting Rack. 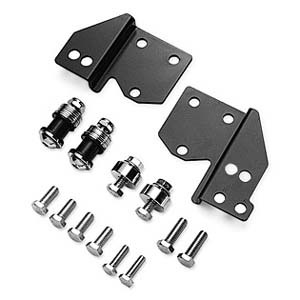 Kit includes mounting bracket, all mounting hardware and wiring harness. Fits '14 FLHTCU, FLHTK and FLHTKSE models equipped with Detachable Two-Up Tour-Pak®. 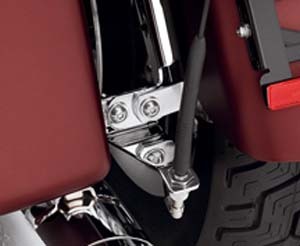 HD-400: The CB Antenna Kit mounts an antenna on a Tour-Pak® luggage system or the right side of the fender (see fitment for correct kit). 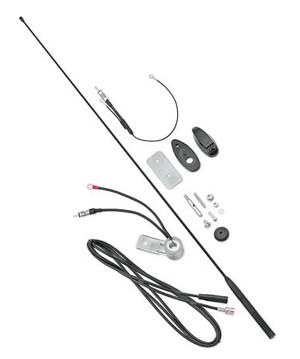 Kit includes Original Equipment style CB Antenna, all necessary mounting brackets, cable hardware, and instructions. Fits all Tour-Pak® luggage systems. Fits '09-'13 Touring models (except FLHTCUTG) with Tour-Pak® luggage. Includes Fiberglass CB Antenna. 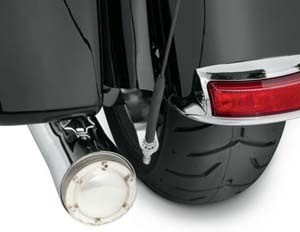 HD-410: The CB Antenna Kit mounts an antenna on a Tour-Pak® luggage system or the right side of the fender (see fitment for correct kit). 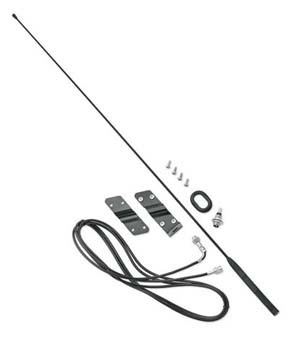 Kit includes Original Equipment style CB Antenna, all necessary mounting brackets, cable hardware, and instructions. 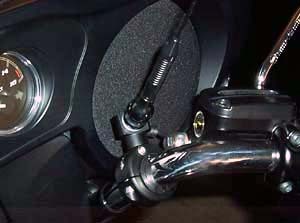 Enables installation of a CB antenna on the right side of a fender. 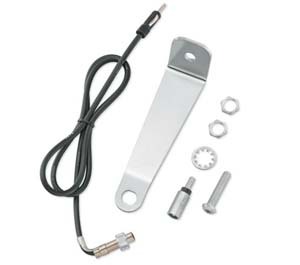 Kit includes CB antenna and mounting brackets. Includes fiberglass CB antenna. Fits '09-'13 FLHX, FLTR and FLTRX models. Does not fit CVO™ models. 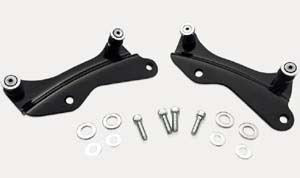 HF-BRKT: If you have a "Hi Five" setup...special sale on one set of Quick Detach Brackets. Only "Hi Five" hardware compatible. Special sale, no returns. 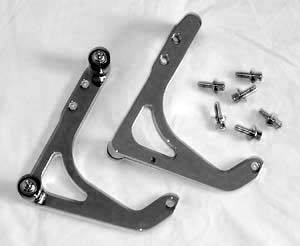 HD-STP: Tour-pak rack docking hardware for softail platform. Specify model and model year.